Subscribe to my list and receive exclusive discount coupons on my Divi Child Themes. Before we begin, make sure you have Divi installed on WordPress before installing this child theme. We recommend doing this on a fresh WordPress installation. The Divi theme is not included in this package. To download Divi, you must have an Elegant Themes Membership. Some images have been replaced due to licensing. The page links from buttons and logo are removed, so you need to relink those to the right pages. Download and unzip the ‘Contractor_Child_Theme_UNPACKME.zip’ file to your computer. In your WordPress dashboard navigate to Appearance > Themes and click on Add New. Locate the contractor-div-child-theme.zip file in the Contractor_Child_Theme_UNPACKME folder on your computer and then click Install Now. When the install is complete click on ‘Activate’, you will then see the Contractor Child Theme as the active theme in your theme panel. This theme recommends the following plugins: Widget CSS Classes and Widget Importer & Exporter. Begin installing these plugins by clicking on Begin installing plugins. On the next screen, you need to check all the plugins and choose to install in the dropdown. Hit apply, and the progress will begin. Now you need to activate all the plugins. Click on Import and upload Contractor Theme Options.json. Click on Import and upload Contractor Customizer Settings.json. Click on Import and upload Contractor Builder Layouts.json. Go to Appearance > Widgets. If there are widgets in the Sidebar, then remove them all. Create a new Sidebar. You can give it any name that you want. Go to Tools > Widget Importer & Exporter. Choose the file Contractor-widgets.wie. Click on Import Widgets. Go to Pages > Add New. Give your page a name for example Home. In the Divi Builder Click on Load Layout then click on Your Saved Layouts. Here you will find all the pages from the demo. Load the Home page Contractor and publish it. Don’t forget to add a menu and set the Home page as static. Some images I used on the demo website are paid versions, so I have those replaced with free ones. Go to Appearance > Menus and add the CSS class cta_menu to the menu item that you want to appear as a button. Note: in case you don’t see the class field then go to the right top corner and expand screen options. Then check CSS classes. Go to Appearance > Menus and create a new menu. Under Menu Settings don’t check anything. In this menu you need to add the pages you want to show up in the sidebar. Note: If you imported the widgets with the widget import function as described in step 4 of installing contractor child theme then you don’t have to do the steps below. You still need to assign the menu in the Navigation widget. 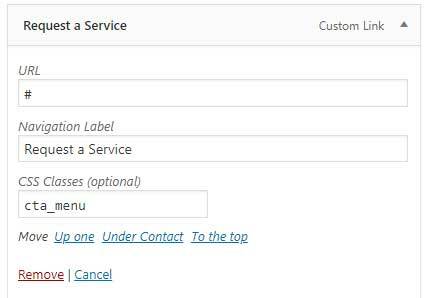 When you create a page with the Service Page Contractor layout you can add this sidebar to it. The top header is a custom section and disabled in the visual builder. To edit the top header go to Divi > Divi library and open the Top Header. You can make your edits here. Click on top-header-bg.svg on the right side. Here you will find 2 color codes. Change these color codes and hit update file. The colors of the Call to action button (Request a service) you can change in appearance > editor (switch back to style.css on the right side). At line 29 you can change the color code. Go to Divi > Divi Library and open Call To Action Fixed. On the image below you can see how the various modules are linked. To create the same dropdown menu with an image as in the demo (under Services) you need to add some classes to the menu items. The second class is mega_menu_first and need to be added to the first child (level 2). In my case this one is also called services. Menu items that fall under this don’t need a CSS class. The class for the image is mega_menu_image. You need to add a custom link and upload an image to your media library and copy the image link. Then use this code and replace the image link with yours and place it on the navigation label (see image). The correct size of your image depends on the number of dropdown menu items you will be using. The image I used in the demo has a size of 140x160 pixels. Most colors you can change in the modules and customizer. To change these colors go to appearance > editor. Under CHANGE COLORS you can modify the color codes. Go to Load From Library > Add From Library and choose Single post. Place in the excerpt box the text that you want to show on the blog page or blog grid page. You find this box under the Divi page builder in the post page. To edit the content of the 404 page, you go to Divi > Divi Library. Then you open the 404 page. You can make your edits here.